The ACM SIGGRAPH community is entrenched throughout social media. From exchanging tips, to sharing photos and video clips from our conferences and chapter events, our social networks are alive with activity from a wide variety of contributors that include students, professionals, educators, artists and scientists. 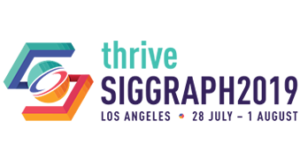 At its core, ACM SIGGRAPH is about connecting people -- so why not take advantage of the opportunity presented by our various social media channels. Engage and network with your fellow computer graphics and interactivity enthusiasts.